Before you fob this one off as far too 80s to make a return, check out the painterly cobalt lids at Missoni. Eyelids accented with shades of blue was perhaps the biggest beauty trend of the season. We watched Lucia Pieroni paint model’s middle lashes with MAC Chromocake in Cyan at Mary Katrantzou, Lucia Pica blend a wash of sea-blue in a doe-eyed shape over model’s lids at Roksanada Illincic and Tom Pecheux transform models at Chanel into superheroes with a mask of blue across the eyes. Any shade goes, so work with your skintone – think baby blues for lighter skin, turquoise for medium skin and cobalt blue for darker skin. No longer just our gym go-to, the classic ponytail has been elevated by a simple twist. Seen at Public School, JW Anderson and Sportmax this hairstyle looks intricate in detail, but it’s simple in practice. It’s also the perfect hairstyle for summer, especially if you suffer from frizzy humidity hair. Simply split your ponytail in two, twist from the centre outwards, then wrap around each other. If you sometimes worry your mascara looks clumpy, don’t. This season, you’re bang on trend. 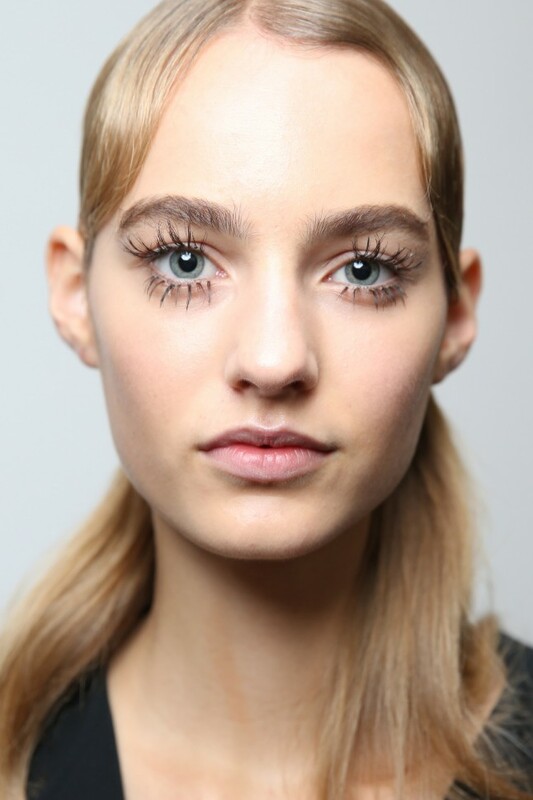 At Marni lashes were larger than life in the form of spidery extensions, while at Marc Jacobs, models were made to look like they had been out all night. The trend was taken even further at Jeremy Scott and DAKS where lashes were literally drawn on with eyeliner for an almost comic book effect. Hair accessories have always been around, but this season sees a play on whimsical notions: think A Midsummer Night’s Dream. At Rodarte, antique gold brooches were placed in model’s hair haphazardly to create a blithe look, while at Dolce and Gabbana, head scarves and flower halos were alternated throughout the show. The girlier, the better.